Levansri Makalanda is the lead consultant for interventional neuroradiology at Barts Health NHS Trust – the largest in the UK. He has considerable experience in the treatment of haemorrhagic and ischaemic stroke cases with current best practice techniques. He also treats traumatic vascular injuries, nosebleeds, reduces tumour blood flow prior to surgery and uses sclerotherapy for the treatment of venous and lymphatic malformations. His particular areas of interest are the treatment of complex aneurysms and arteriovenous malformations. 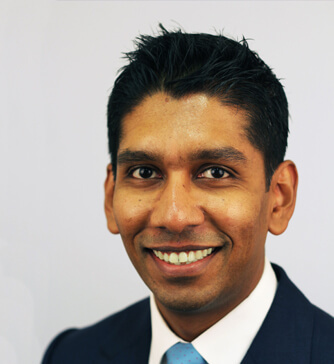 He is a qualified gamma knife radiosurgeon and lead for treatment of intracranial vascular malformations at the London Gamma Knife Centre at Barts. He has a comprehensive spine practice that spans perineurial, facet, epidural, intradural and vertebral spinal procedures. Dr Makalanda qualified from Guy’s, King’s and St Thomas’ Hospitals medical school (now part of King’s College London). Having completed his basic surgical training on the Hammersmith Rotation, he completed a year as a Cardiothoracic Registrar at The London Chest, then a registrar post in Intensive Care Medicine at University College Hospital, London. His radiology training was based at The Royal Free Hospital, including neuroradiology at Queens Square and Great Ormond Street. A specialist interventional neuroradiology fellowship program was then undertaken in Glasgow with Professor Bhattacharya where he also completed the basic and advanced diploma courses in Diagnostic, Intervention Endovascular and Intervention Spine from the European School of Neuroradiology. He has had a number of local, regional and national roles in both diagnostic and interventional neuroradiology. He currently represents the neurointervention arm of Barts Health stroke unit at the pan London Stroke meetings and is involved with improving the local stroke pathways, aligning Barts Health as a central network hub. He is a member of the British Society of Neuroradiology, the UK Neurointerventional Group and the European Society of Neuroradiology. He has spoken both nationally and internationally on his interests and research in both diagnostic and interventional neuroradiology. He is a peer reviewer for a number of journals and also a proctor – teaching other consultants how to use new devices.